According to Corporate Insight, plans can see as much as a 50% increase in communication with Millennials by using social media versus relying on call centers and in-person interactions. Corporate Insight suggests ways plan sponsors can use social media to increase participant engagement. The company first suggests responding to inquiries via social media, and secondly, to ask for feedback from participants. Plan sponsors should tailor each post to the strengths of each platform. For example, Facebook can be used for general information and dialogue building, YouTube can be used for succinct and/or witty video content, and Twitter can be used for concise announcements. “Do not build social media pages that will remain dormant or unused,” Corporate Insight says. “Accomplish more than just dialogue building by linking to resources and articles when applicable.” The firm also suggests incorporating infographics wherever possible. Corporate Insight suggests using standard business language: don’t be too formal or try to speak in the perceived voice of a specific generation. However, plan sponsors should keep in mind the audiences they are most likely to reach through each medium. According to the firm, plans can see as much as a 50% increase in communication with Millennials by using social media versus relying on call centers and in-person interactions. Finally, Corporate Insight says, while a social media manager would be nice, plan sponsors do not need one to get started posting. 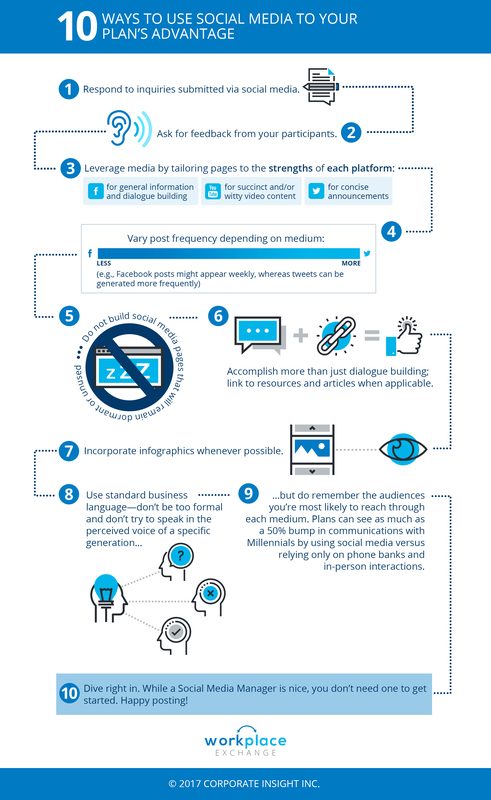 An infographic of Corporate Insights’ suggestions is here.